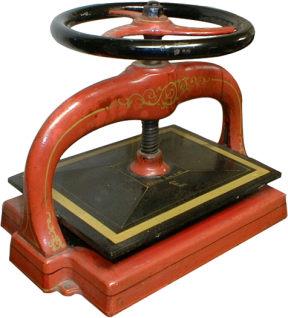 While the copy press is not a letterpress, it is an important part of any well-outfitted print shop. Copy presses (also known as book or nipping presses) were traditionally used as primitive copying machines; modern-day uses include pressing water out of handmade paper and drying flowers. How did a copy press make copies? An original letter, freshly written but dry, was placed between slightly moist sheets of very thin paper (which was thinner even than onion-skin paper). When these pages were pressed together, the moist paper would pick up some of the ink from the original document. The writing was reversed on the copy and, like the original, would be slightly blotted, but could be read from the back of the thin sheet. This process, common in the middle of the nineteenth century and well into the twentieth, was patented by James Watt in London in 1780. The original red, black, and gold painted detailing on this press is mint condition, and the press bears the gold inscription of the patent date: June 13, 1865.